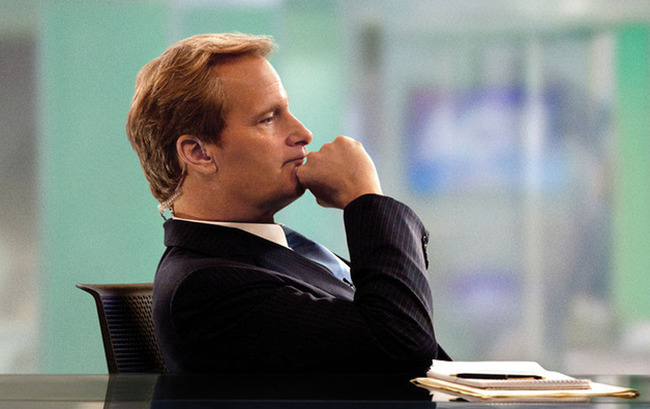 If you’ve been following the blog, you know that I was absolutely hooked on The Newsroom when it premiered last year, and then of course, lamented the fact that the season was over, and it was an interminable time until Season 2 began. I even went out and bought the entire series of the West Wing (in a gorgeous box set I might add) to help fill the time, and constantly feed me a healthy dose of Aaron Sorkin until the series returned. It finally did this week, and I was delighted. We pick up almost where we left off, but it seems some of the season is going to be told through flashback, as both Will McAvoy (Jeff Daniels, still being amazing) and Mackenzie ‘Mac’ McHale (Emily Mortimer) are being interviewed, separately, by ACN’s lawyer, Rebecca Halliday (Marcia Gay Harden) about the condition of Maggie (Alison Pill) following her investigation into a black-ops affair referred to as Genoa. So through the telling of the story, we roll back to August 2011, Jim Harper (John Gallagher Jr.) asks to take a 2 week leave of absence to get Maggie out of his head as she’s trying to work things through with Don Keefer (Thomas Sadoski). He decides he wants to hop on the campaign trail and spend some time following the Republican campaign and it’s nominee Mitt Romney. He, and Will soon learn that Will’s comment about the Tea Party being the American Taliban (which apparently was an insult to the Taliban) has stirred up a political hornet’s nest for the channel, and they are being locked out of meetings, interviews, anything that the Republicans may have their fingers in. It costs Will the center seat for the 10 year Anniversary of 9/11 broadcast, which despite his denials, infuriates him. There are other issues starting to rise up, Sloan Sabbith (Olivia Munn) and Jim’s stand-in producer Jerry Dantana (Hamish Linklater) are trying to get Will and the channel to pursue drones, which leads to an interesting panel debate on air with a retired Air Force Captain (who afterwards gives Jerry the lead on something called Genoa (which we haven’t learned about yet)). 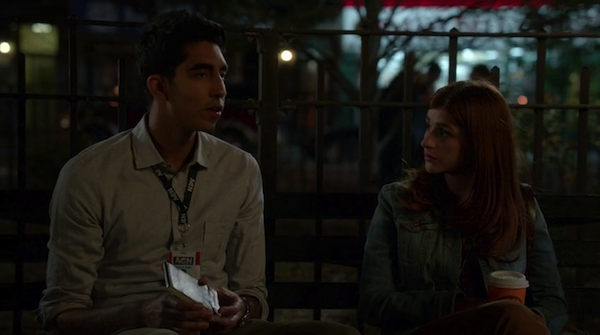 Neil Sampat (Dev Patel) is continuing to pitch ideas in the show’s meetings, and he’s just heard about a domain name being registered as well as an email that went viral for something called Occupy Wall St. Mac doesn’t think there’s anything to it yet, but advises Neil to attend a meeting and find out what’s really going on with it. So right from the get go, with this Genoa thing, and the American Taliban thing we know there is trouble for Will and company, there are still the personal issues floating around the office, turning it into a bed of hopping hormones with switching dance partners. 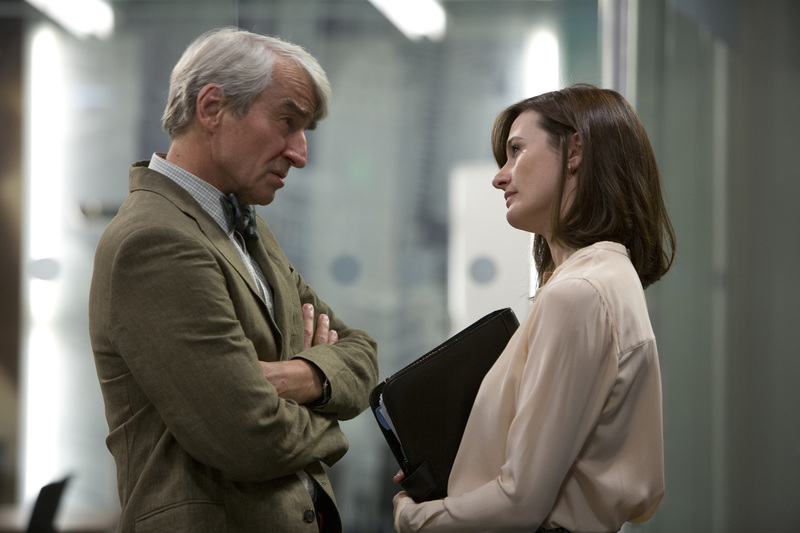 Overseeing it all is Charlie Skinner (Sam Waterson) who is still wonderfully cantankerous, and is still defending Will to the Lansings, both Reese (Chris Messina) and his mother, Leona (Jane Fonda) and keeping Will away from them. It was so great to fall so easily back into the series, and may see me picking up the blu-ray of the first season before week’s end. To me this is smart and fun television, and I love the look, albeit fictionalized, of how a news show is run. Did you see the season opener? What did you think?